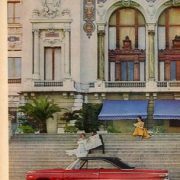 For 1963, Ford saw no reason to radically change a good thing, and the 1963 model was essentially unchanged save for some freshening and added trim. A lower, fastback roofline was added mid year to improve looks and make the big cars more competitive on the NASCAR tracks. 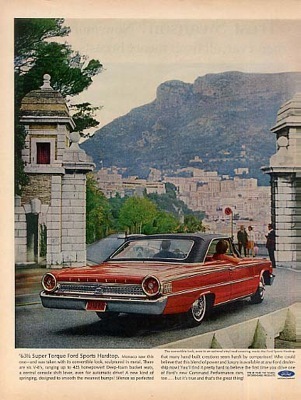 This 1963 1/2 model was called the “Sports Roof” hardtop. 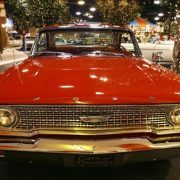 While not much changed for the everyday buyer, for the performance oriented things were a little different – for partway through this year and in limited quantities there became available Ford’s new racing secret weapon, the 427, replacing the 406. 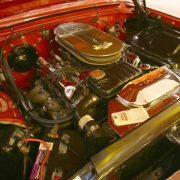 This new engine, designed for performance rather than refinement, was offered to the public simply because racing rules required the use of only engines sold in sufficient numbers in production vehicles. 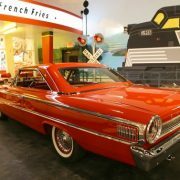 Ford took the 427 cubic in (7.0 L) equipped Galaxie to the dragstrip in serious fashion beginning in 1963, building a number of lightweight cars just for that purpose. 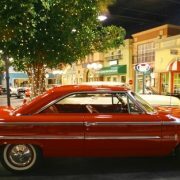 They featured fiberglass fenders, doors, trunklid and aluminum bumpers. 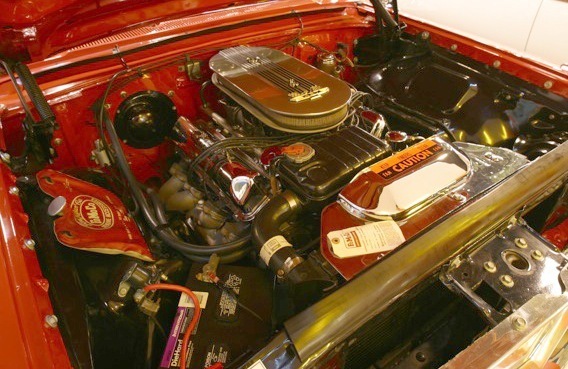 Rated conservatively at 425 hp (317 kW), this engine also featured in Carroll Shelby’s final incarnation of the AC Cobra. 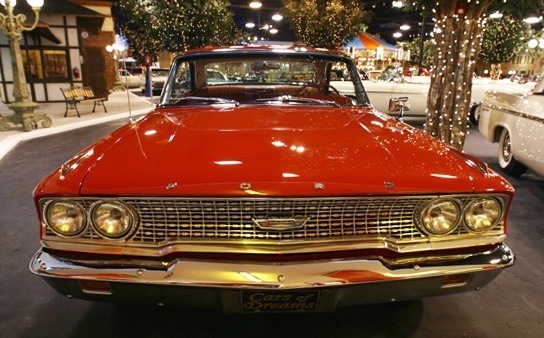 The base Galaxie was joined in 1963 by the barebones Ford 300 sedan. 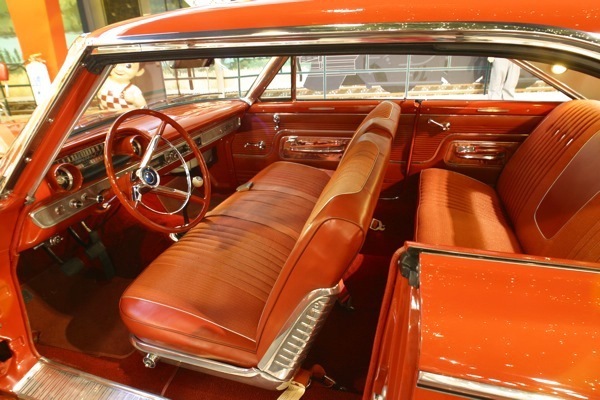 Inside, the ’63 featured a totally new instrument panel, and gone was the separate column for the shift lever located above the steering column (Chevrolet had eliminated this design in 1954). What’s with the “sledgehammer” monker? To be totally honest, this full-size Ford is the automotive equivalent of a sledgehammer. Take a look at it. This is NASCAR parked in the back alley. Black steel wheels, dog-dish caps, giant racetrack-style mounts front and rear, and oh yeah, those small gold emblems at the front of the fenders. you know, the ones that say “427”. And it’s not a Q-code baby (not that there’s anything wrong with that), it’s the evil R-code lurking under that vast expanse of sheetmetal. The one with glowing red eyes and steam pumping from its nostrils. The one that pumps out 425 horses at 6,000 rpm and 480 lbs-ft of asphalt searing torque. The one that gulps cubic air at a rate of 1560 cubic feet per minute. If this car’s not the biggest hammer in the shed, we don’t know what is. 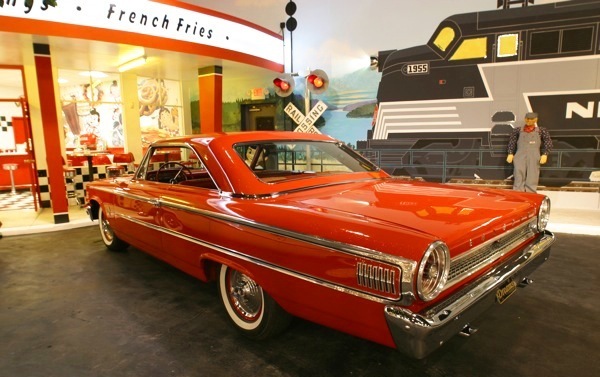 Let’s take a look at the ’63 Galaxie (not the 63-1/2) for a minute. 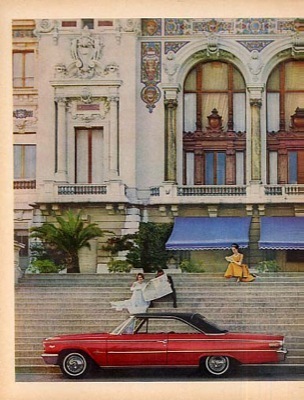 Nineteen-sixty-three was essentially a two-tiered model year, with changes resulting in both a new body style and increased firepower. 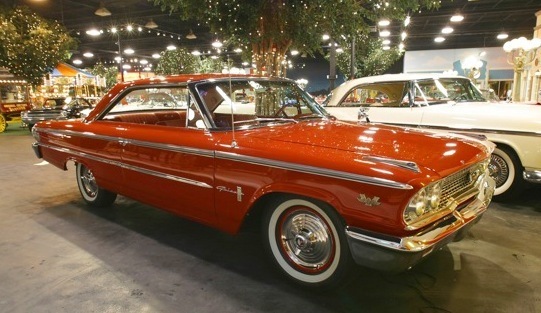 The new ’63s took a fairly big styling jump from their ’62 brethren. 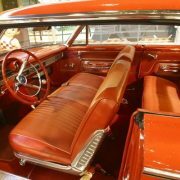 Although the same basic body “shell” was used, all the exterior sheetmetal was new, and the look was decidedly fresh and more powerful. 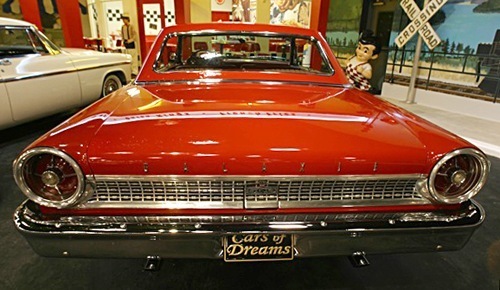 The taillights grew in diameter, the grille had a flatter, more agressive look. 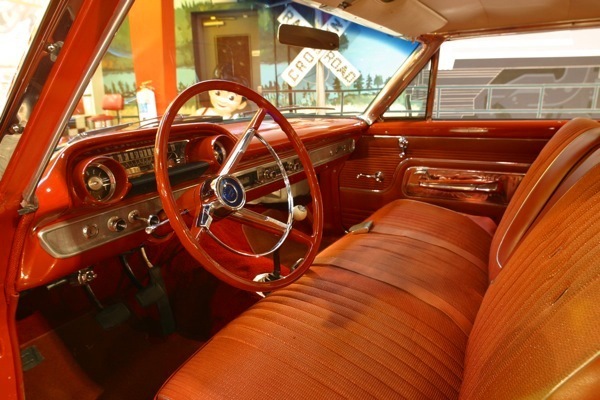 The interiors changed by introducing a brand new dash layout and offering the “space-age” option of a swing-away steering wheel. Exterior dimensions were up slightly, with overall length now almost topping 210″, and width at an even 80″. That’s as wide as a current model SuperDuty Ford pick-up, in case nobody was paying attention. Under the hood there was some new stuff happening as well. No more early Y-block 292. 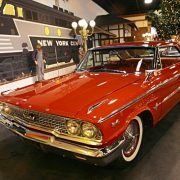 It had been replaced with the “Challenger” 260, now producing 164 horsepower (later in the ’63 model year the 195 hp 289 came on board as the “base” V8). The old stand-by X-code 2-bbl 352 had been carried over from ’62. If you were after a little more zoot, the family of 390 cubic inch motors was the next rung up the ladder. 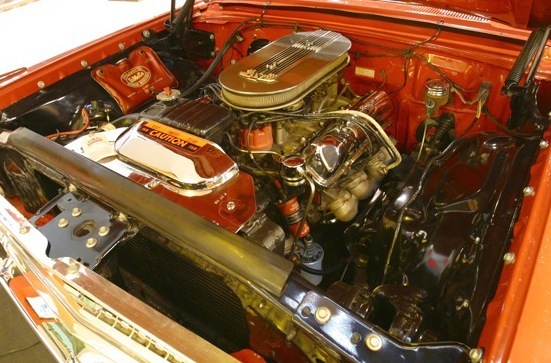 It was available in 3 different incantations: the “base” Z-code 390 was rated at 300 hp, the “police interceptor” dialed in at 330 horses and the M-code 390 offered 340 (the extra 10 courtesy of its 6-barrel carb set-up). 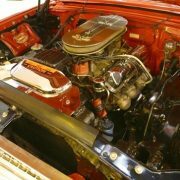 The 406 top dawg big block was still king of the hill for early ’63 (its second year of production), but as replaced later in the calendar year by you guessed it, the big bad 427.The legendary 427 was achieved by increasing the bore of the 406 from 4.13 to 4.23 inches. The block only had 4.63 inch bore centers, so this really pushed the bore capacity to the ragged edge. Since the new motor became the obvious choice for the heavy-of-foot, the inevitable happened. The now outdated 406 was swept under the carpet after only a year and a half of production. Not only was the 427 available as a 4-bbl (Q-code), you could also order it in an 8-bbl configuration. Yep, the mighty sledgehamme”R”-code. 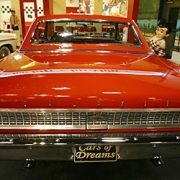 This thrilled the hot-rodding public and the NASCAR boys to no end. Ford no longer had the ugly shadow of “just not quite enough cubes” hanging over its head. 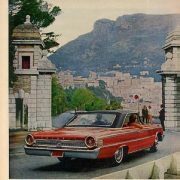 When you ordered the 427 engine option at the dealership, you also ensured that your car would come with a host of other upgrades: 15″ wheels and tires (14″ was the standard), a beefed up frame, heavy-duty suspension all ’round, bigger brakes and a stronger driveline. And you could get any transmission you wanted, as long as it was a 4-speed. Another big change happened literally the same time the 427 came on the scene. The introduction of the new Sports Hardtop. See how sleek our feature car looks? 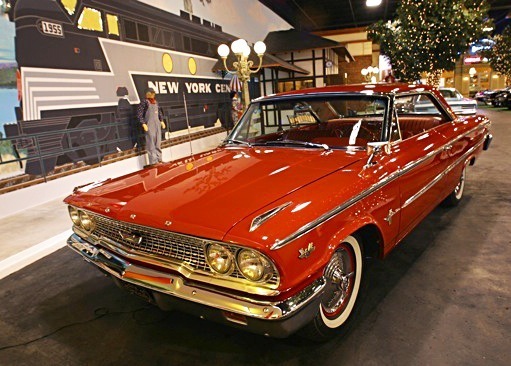 The new body style was a 2-door hardtop with sloping rear pillars and a smaller, formal rear window. Not only did it look lower than the notchback hardtops, it was lower, by a whole inch. 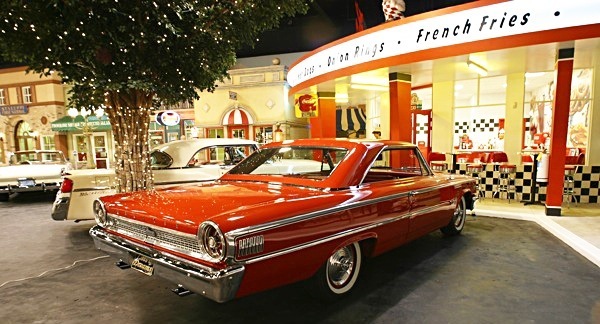 It quickly became known as the “fastback” Galaxie. 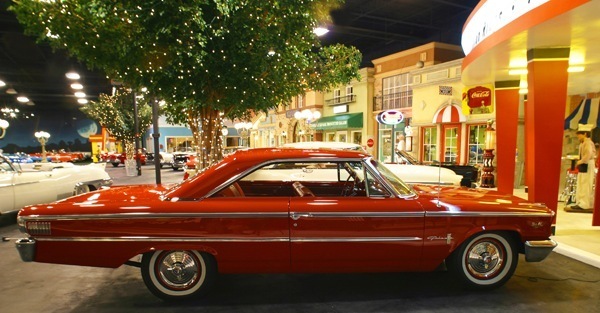 And although it was much sleeker looking than the notchbacks, it technically was not a fastback (at least not in the Starliner tradition!). 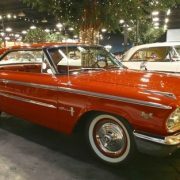 The new Sports Hardtops were available in both the Galaxie 500 and the XL series, and man did they ever take over the sales lead quick. The buying public just lapped up the sleek, lower style. The new design also was the answer to the racer’s prayers. The lower drag coefficient (a result of the lower ride height and the sweeping rear roofline) proved invaluable on the superspeedway. 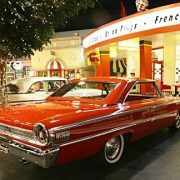 That, and the fact that the R-code 427 was readily available, helped Ford stock car teams dominate the NASCAR circuit for an entire season! 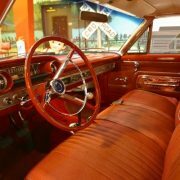 The 1963-1/2 Galaxies, with all their new-found vigor and style, became known as the Super-Torque Fords. Indeed.